10 weeks, hundreds of fish and unforgettable memories…. 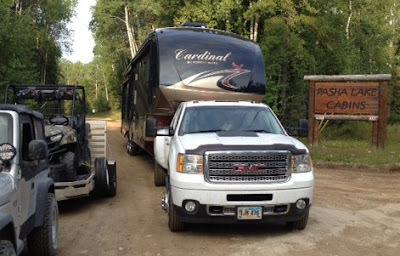 It was with mixed emotions we pulled out of Pasha Lake Cabins and headed south back to The States and eventually South Dakota. We were planning on staying a few weeks longer but hitch itch got the wheels rolling early Sunday morning. This area is one of our favorite hang outs for the year and we are going to miss it. Most of all we are going to miss Chad, Michelle and Wanda whom we spent countless hours hanging out, walking or spinning tales. We also reconnected and met with other friends while on their annual fishing/hunting trips; Bob, Chad L, Nate E, Kim….for some this is the only time we will see them for the year while others we hope to catch up with again while on the road this fall in winter. But before we left we had more visitors! My sister Carol, her son-in-law Steve and her grandson Aiden were able to spend an event filled week with us before we left. We had not seen Carol in over a year and it had been several years since we had seen Steve and Aiden. Aiden is now 15 and full of excitement and questions during his first visit to Canada. With bear season in full swing, much of my time was consumed with checking stand sites and recovering bears. All three were able to join me on at least one of these adventures as well as several fishing excursions. Steve and Aiden getting ready to do some fishing! Speaking of bears, by the time we left 14 bear hunters had arrived in camp harvesting 14 bears, a perfect 100% the first 10 days of the season! It does not get much better than that. This one represents how our fishing trips truly go, none of this edited video to make Barb look good and me look bad, just true to life fishing as it usually goes every trip. Because of my honesty, life for me around here is going to be miserable for a few days.......Your thoughts and sympathy would be appreciated! This past week was one of our favorite weeks we have had since coming up here in June. It was also one of the most stressful….. If you read last week’s post, I introduced the “Bobs” in our lives. Two of those three came up to do a little fishing and bear hunting this past week. It had been months since we have seen either of the Bobs and wanted to show them the best possible time. Barb and I were confident that we could get them on the fish but fulfilling someone’s dream bear hunting trip can be very stressful as the bears are much less predictable and there is so much out of our control. Brother Bob was the first to arrive on Monday afternoon with Farmer Bob arriving the following morning. Since it was opening day of bear season I was excited to get Farmer out on his stand. I had two areas in mind for him with multiple bears visiting each site. I had set up a ground blind for him in each area for him to sit in and hunt. A ground blind is basically a camouflaged tent with multiple windows around it so the hunter can sit in a chair and have up to a 360 degree view of the surrounding area. After dropping him off at his site Brother and I returned to camp and anxiously awaited his return. Including Farmer, there were a total of 5 bear hunters out. 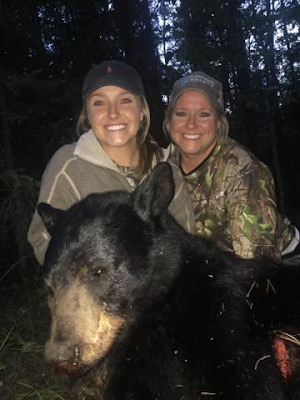 Two of the other hunters included Kim and Breanne a mother/daughter team from Texas also on their first bear hunt. Since it was Tuesday the rest of the camp was at the fish fry when we heard a car coming down the drive at 6:30. Did Farmer Bob shoot one already? When the vehicle pulled into camp we saw it was not Farmer but Kim who had shot a bear within her first hour on the stand! A half hour later we heard a 4 wheeler coming down the drive. Not Farmer Bob, he was driving a truck…. When this hunter pulled into camp we saw that he had a bear on the back of it. 2 bear for 5 hunters and we were only hours into the season! Certainly Farmer would see something tonight….. Day turned to night and the other 3 hunters returned to camp bearless. Breanne had seen a bear while Farmer and the remaining hunter saw nothing but squirrels and chipmunks. No worries, there are 5 more days to hunt…..
Day two after Farmer went to his blind, the rest of us just relaxed around camp. He pulled into camp after dark and reported another bearless night while Breanne pulled the trigger on a nice bear. Two nights and Bob has not even had the slightest of bear sightings! And here I thought I was the Bear Whisperer setting him up in this great spot. Ugh! The pressure is starting to build! The next afternoon after getting Farmer out to his stand, Barb, Brother and I went fishing. It ended up being one of our top fishing days of the season fish after fish after fish! Maybe all this fish activity will translate to active bears in the woods. When Farmer returned that night he reported that he had seen one bear for a few seconds but it was small. Well, at least he saw something! Day four time to switch it up…. This afternoon we were going to move Farmer to another hunt sight to see if there was more action. Barb, the two Bobs and I went fishing in the morning and brought the 4 wheeler with us to the lake so Farmer could go hunting directly from the lake. We fished the same lake and the same spots as the day before but the fish were not nearly has active. We had a good day but not a great day like the day before. Bob headed to his ground blind around 3:00 as we headed back to camp. Two other hunters arrived in camp and the remaining hunter from the original 5 hunters arrowed a 300+ pound boar. Now Bob was the only hunter from the first group not to get a bear. Now the pressure is really mounting and I am seriously second guessing myself! When he returned that night he was all smiles, he had not gotten a bear but a smaller one entertained him that night by hanging around the area and he was thrilled to get to see a bear in the wild for an extended period. That made me feel a little better, at least he was seeing bear! Look at who is doing all the work while the boys just sit back and enjoy the day! Day five….only two nights, left time to close the deal or go home without a bear….Thunder, lightning, hail and rain for most of the afternoon. Other hunters came in early but Bob stuck it out and the evening sit turned out to be perfect. It was almost dark when he said he noticed movement out in the woods. A Bear! After looking it over Bob decided that this is going to be “The bear”. As he was lining up the shot something spooked it and it took off into the bush, so much for that night’s opportunity. To top it off one of the newly arrival hunters tagged a bear. Now the hunters from the second group were getting bear and Bob, with only one day left to hunt had yet to pull the trigger….. If he does not get a bear Barb and I will not be able to show our faces in North Dakota again! The last night of his hunt we not so patiently await his return. Soon we hear a 4 wheeler coming down the drive but alas it is not Bob, it is another hunter from the second group with a nice boar. Day turns to night and I mentally start altering our fall plans as we can no longer spend our fall in Bob’s farm in North Dakota…..Bob pulls into camp well after dark but instead of going directly to his cabin be pulls up to our trailer and says: “I shot a bear!” He said with only minutes left in the day he saw the tan muzzle of a bear moving through the brush, it was now or never and was able to make a clean shot. High fives and hugs all the way around and we head back out to the bush to recover his bear. It had only gone 20 or so yards after the shot and after a short drag to the 4 wheeler we had it loaded up and were headed back to camp. We were up until 2:00 skinning and butchering the two bear that came in that night but the excitement level was high. All in all it was a great week. Great times fishing and visiting with my brother, we don’t get to do that as much as we used to. Barb prepared great meals every day; pancakes, French toast, fish, ribs, blueberry pies and cobblers with lots of ice cream! I think we all gained 5 pounds throughout the week….. Both Bob’s gone Barb and I relaxed for one afternoon as we had more guests arriving that night. My sister Carol, her son-in-law and grandson were arriving that night for another week of fishing and adventure in the North Country! Farmer Bob with his bear! After last week’s fiasco I was looking forward to a nice quite week of fishing without any life threatening incidents. I had a couple of incidents that could have been bad but am happy to report there was no threat to life or limb in the past two weeks. So Barb and I have a lot of “Bob’s” in our lives…. so many we have given them mini nicknames when we talk about them. This post and probably the next several will includes 3 of our Bob’s. First there is just plain Bob. He and I have been friends since high school. Although we don’t get to see each other as much as we would like our friendship continues and we are able to get out hunting and fishing several times a year. Then there is “Farmer Bob” who owns the Finken Farm in North Dakota that we visit for several weeks each fall. To make things even more confusing “Bob’s” son Chris married “Farmer Bob’s” daughter Holly who also lives on the Finken Farm. Last but certainly not least there is “Brother Bob” who is…..my brother. Got it? Okay on with the post…..
Bob came up for the week with several of his customers. He and coworker Greg have been bringing up a group of customers for the past 5 years. This year their group was from Minnesota, Wisconsin, Illinois and Ohio and had not been up here before. In fact many of them had not met until they started driving up here. Barb and I were able to get out fishing with them several times showing them some of the hotspots on a couple of the area lakes. There's a happy group of fisherman! They were mainly after large Northern Pike and Walleyes and they connected on both. 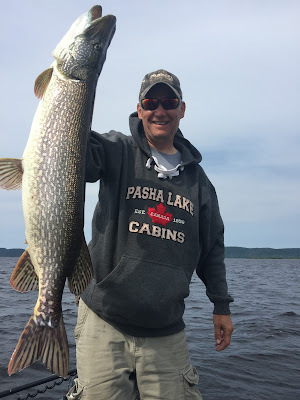 Two people in their group caught 40+ inch pike and one of them caught a 30+ inch walleye. A couple of nice pike! One of their adventures involved going on the “Walleye Dream Trip”. This trip consists of an ~ hour drive to the boat launch and another 45 minutes by boat to the fishing location, a river dumping into Lake Nipigon. Barb and I have gone on this trip several times and can attest that it is truly a dream trip. You are catching walleyes as fast as you can get your jig in the water. The average fisherman who knows what they are doing will catch anywhere from 100 to 150 per person for the day averaging about 18-20 inches. It was on this trip the two large pike were caught as they too like to hang out in this area to snack on the walleyes. The week went way too quick and before we knew it they were gone and a new group of fisherman had moved into their cabin. I also got out two more times with other groups, one from Michigan and one from Iceland of all places. Both were great groups and many fish we lost count of how many fish we caught. The highlight of the Michigan group was the fact that there were 4 generations of their family present and everyone made the mile + walk into Onaman, even the 95 year old. It may have taken him an hour but by God he made it both ways. I can only hope to be so lucky! Gene reeling in a big one! I even managed to catch a fish or two! With bear season less than a week away we have also been busy preparing hunting sites for several friends that are coming up. The resort has a total of 23 hunters this year so that is a lot of sites to prepare. “Farmer Bob” is coming up in less than 10 days for his first ever bear hunt and I want to make sure it is a good one, scouring the bush looking for just the right area for him to hunt to make it as successful as possible. We have been traveling many of the back logging roads looking for just the right spot. Many of these roads have not been accessed in years, some are littered with fallen trees while others have waist high grass or wild flowers covering them. A chainsaw, a winch and a spare tire are a must. Over the past 10 days I have had 3 flat tires and on two occasions in the past week I got the 4 wheeler stuck having to winch it out. Once was in a big mud hole I thought I could make it through and again while trying to navigate along a washout when the edge gave way and tipped me on my side. No camera both times but I was able to take this picture of the area I got stuck the next time I went by it. It was a little softer than I anticipated! This past week I just got done scouting and was driving home when I smelled what smelled like someone smoking marijuana. I mean if I knew what that smelled like I imagined this was it……I looked around to see where it was coming from and saw a cloud of smoke behind me coming from under the jeep. This had happened to me once before and I knew exactly what it was. The weeds I had been driving through compacted between the skid plate and the muffler and were smoldering. Since I was within minutes of the resort I did not stop but continued on into the resort to the boat launch and right into the lake….problem solved! I then spent the next 30 minutes digging enough compacted grass and weeds from the undercarriage to fill a 5 gallon bucket. I now have a fire extinguisher in the jeep…. Last but not least in our group of Bob’s is my brother Bob who is coming up for a few days on the 14th with his wife Greta. We hope to get out and do some fishing, berry picking, bear retrieving and just plain exploring and hanging out.